Panacur comes in an easy to use syringe which will treat up to 600Kg bodyweight. It is flavoured with apple and cinnamon and is effective against non resistant large and small redworms, redworm eggs and pinworms. Contains Fenbendazole a benzimidazole product, which is indicated for the control of large redworm, encysted early third stage, late third stage and fourth stage small redworm larvae, small strongyles, pinworms, ascarids, and arteritis caused by fourth stage larvae of Strongylus vulgaris in horses. One tube will treat a 600kg horse. Waiting time Meat 20 days. The basic mechanism of action of anthelmintic fenbendazole is an inhibition of polymerization of tubulin into microtubules. This important structural properties of helminth cell are affected, such as the training of the cytoskeleton, spindle formation during mitosis as well as uptake and intracellular transport of nutrients and metabolic substrates. As a result, there is a depletion of energy reserves with subsequent death of the parasite and its expulsion after 2 - 3 days. Fenbendazole also has an ovicidal effect, which occurs after about 8 hours. The active ingredient is highly effective against adult and immature gastro - intestinal - nematodes and lung worms, and against inhibited larvae and histotrophe. Single dose of Panacur worm paste. For therapy in infection of horses and other equine blood worms, large and small strongyles and small strongyles larvae in the intestinal lumen and of benzimidazole - sensitive roundworms, Pfriemenschwänzen and dwarf nematodes. place at any stage of pregnancy or lactation. Homeovet Vet.Practice free prescription service. It is recommended that horses and ponies are routinely wormed with a single dose of this product every 6 to 8 weeks. In Late Winter or Spring, mass emergence of encysted mucosal small redworm from the horse’s gut can cause parasitic diarrhoea, mild recurring colic, weight and appetite loss and weakness. To avoid this, it is recommended that horses are administered the 5-day Panacur treatment in the Autumn (ideally late October/November) and again in the Spring (ideally in February). All new horses whose worming history is unknown should also be administered the 5-day Panacur treatment. 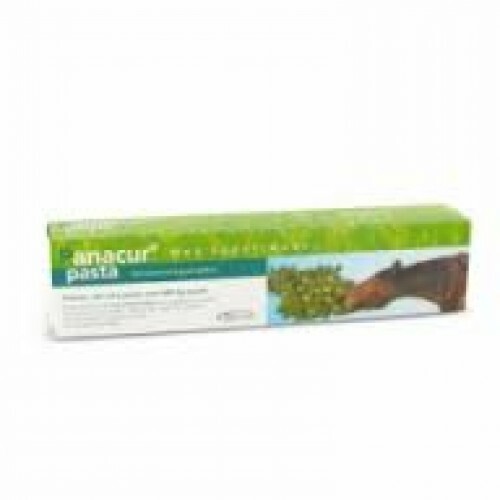 Pregnant mares and young foals may also be safely treated with Panacur at the recommended dosage levels. One syringe per 600 kg bodyweight as a single dose. Administer the paste orally by squeezing onto the back of the horse’s tongue. Assess bodyweight as accurately as possible before calculating the dosage. The use of a ‘weigh band’ is recommended. It is not necessary to withhold feed before or after treatment. For the control of encysted small redworm and migrating large redworm larvae, administer one syringe per 600 kg bodyweight daily for 5 consecutive days. For the control of diarrhoea caused by Strongyloides westeri, in 2-3 week-old suckling foals, administer one syringe per 90 kg bodyweight on a single occasion.